A flexible surf and travel adventure experiencing the best surf spots & activities in Bali & Beyond. This trip is an awesome way to see Bali and surrounding islands of Lombok and Nusa Lembongan. The 9 Day Flexi Adventure combines extra time in Bali exploring the local area and attractions with an island hopping surf adventure, snorkelling and taking in incredible scenery. This is a flexible tour allowing you the ability to choose 6 surf lessons or 6 different activities (or mix and match) including an Indonesian cooking class, yoga, Sasak village tour, an extra massage, SUP hire and a Nusa Lembongan Ilsand Tour. A great way to experience all Bali & Beyond has to offer. The 9 Day Flexi Adventure gives you the flexibility to choose whether you want to surf everyday of your trip or swap out surfing for other activities. Choose your favourite adventure activities whether you want to surf the whole time or swap out a surf lesson with an alternative activity such as a Indonesian cooking class, massage, Nusa Lembongan Island Tour, yoga class, SUP hire or Sasak Village Tour. It's up to you! After your VIP airport transfer, the first 3 days in Bali includes a traditional massage, a surf lesson, time in the surf village of Canggu and an epic day trip to Ubud exploring the Monkey Forest, Tegalalang Rice Terrace and Kintamani Village. Once we depart Bali for the nearby islands Lombok and Nusa Lembongan, you’re on a true adventure. Travelling both over land and on boats between white sandy beach islands you will surf tropical paradises, meet amazing people, immerse yourself into the surf culture, eat great food and experience awesome activities. Departs every Thursday – with VIP pick up from Denpasar airport to Mojosurf Camp Canggu. Arrival into Denpasar, find your Mojosurf driver and head to our Camp in Canggu. Let us give you an introduction to the Balinese culture and help your find you way once you have arrived. Depending on your arrival time, enjoy your massage, a night out with our crew and comfortable first nights’ accommodation in Bali. Up early for a delicious breakfast and day trip up to Ubud (the artistic hub or Bali), visit the Monkey Forest, Tegalalang Rice Terrace then to Kintamani Village to check out the view of the amazing active volcano. Lunch is an optional extra (approx. $10) and can be at the rice terrace or Kintamani. Kintamani Village sits on the rim of the huge Batur caldera about 1,500m above sea level, and offers awesome views of the active volcano Mount Batur and Lake Batur. Tegalalang Rice Terrace is one of the top tourist attractions in Bali, it’s situated in Tegalalang Village just North of Ubud on the way to Kintamani Village and offers unreal views of a rice terrace set into a cliff. Head back to Canggu to chill at the camp or explore the local bars and restaurants. Up for breakfast and a surf lesson with our expert Mojosurf instructors. Enjoy your massage if you didn’t get to on day 1. This evening is when you decide if you would like to swap any of your surf lessons for alternative activities throughout the trip. You will have your surf lesson in the morning or swap for a yoga lesson. Those surfing will be finding fun surf to suit your ability with your instructors assessing your level of surfing. In the afternoon, enjoy your 1 hour massage if you didn’t get a chance to on Day 1 or 3. We spend the night in the Mojosurf Camp checking out the cool evening venues around Canggu. 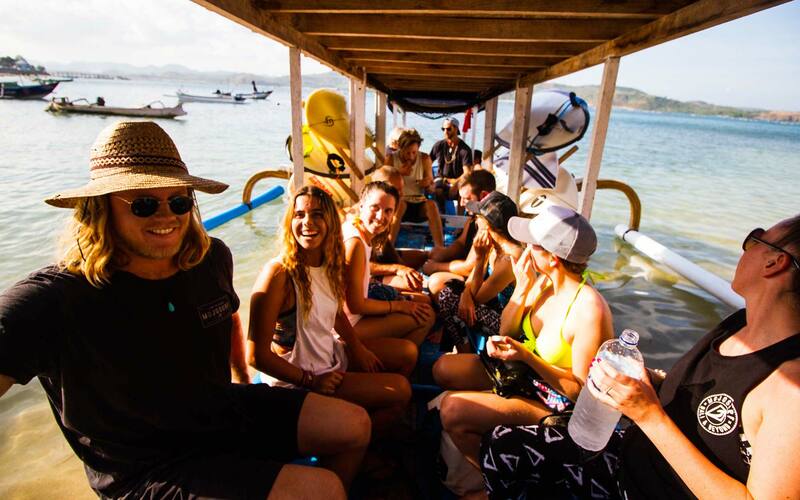 Today we transfer Islands by fast boat from Bali to Lombok where we will arrive in time for an afternoon surf (or swap for an Indonesian cooking class), happy hour and explore new cultures and regions. From white sand beach breaks to cruisy fun reef breaks. Lombok has it all. We will be staying in our super cool retreat in Gerepuk Bay Lombok and enjoying the friendly, chilled atmosphere of this region. Early start to take an outrigger and surf some of the world famous waves in this region. In this area we have a selection of super beginner friendly waves for the learners or more advanced waves for the intermediate. Today is all about surfing in the morning and living the dream in Lombok. Spend the afternoon relaxing by the pool, exploring the local village and beach or maybe treat yourself to a massage (extra cost). Those who don’t want to surf on this day can relax in the morning and then do the Sasak village tour in the afternoon. All up for breakfast, your second surf in Lombok, or swap for an invigorating Lombok massage. Transfer with your Mojosurf guide to one of the most pristine surf and dive islands in the world, Nusa Lembongan. Here we will surf, snorkel, explore and enjoy tropical island living. We will be up early to explore some great surf breaks or swap for a Nusa Lembongan Island Tour, then experience a snorkel with Manta Rays or a snorkel safari and continue living the ultimate lifestyle. The opportunity to try other great water activities are available here on Nusa Lembongan. Spend most of the day enjoying everything Nusa Lembongan has to offer. Enjoy your last surf lesson or swap for a SUP hire. Eat, explore, swim, eat, chillax and then a fast boat back to Bali. We arrive back in Bali around sunset for drinks, dinner, new friends, lifetime memories and ready to celebrate an awesome Mojosurf adventure. The brand new Mojosurf Camp Canggu is located a 5 minute walk from the famous Deus Cafe and the swell down at Echo Beach. We offer modern style 4-8 share dorm room accommodation with ensuites, air conditioning and comfy beds. The camp also has free WiFi, a pool, bar, happy hour, evening activities and lockers (BYO padlock). Our mix of Western and Balinese staff cannot wait to check you in and show you the wonders of Canggu. Our Nusa Lembongan Surf Camp accommodation consists of shared rooms all with modern facilities such as air con, ensuites, comfortable beds and spectacular views of crystal clear water and white sandy beaches. Nusa Lembongan offers a variety of restaurants on the water’s edge with a delicious range of both local and western food. The staff at Mojosurf have handpicked the finest restaurants on the island including the best fish BBQ you will ever have, where the fish is so fresh the staff are still wet from spearing it before your arrival! We will be staying in our super cool Mojosurf Camp Lombok in Gerupuk (Lombok’s most famous surf bay) which is near Kuta (not to be confused with Kuta in Bali) and is situated on the southern coast of Bali’s neighbour island Lombok. Here you will experience spectacular scenery with cliffs and mountains reaching the ocean creating some of the most remarkable views in the world. The small surfer area is quickly growing in popularity due to its laid back atmosphere, fun loving locals, beach parties, great waves and delicious local cuisine. Lombok has pristine white sandy beaches and crystal clear waters with amazing waves for all levels which consist of beach breaks and beginner/intermediate friendly soft-reef breaks. Includes VIP airport pickup, 8 nights shared accommodation at 3 Mojosurf Camps in Bali, Lombok and Nusa Lembongan. Day trip to Ubud and surrounds. Most meals catered for daily, car & boat transfers, 1 surf lesson and 6 surf lessons or flexi activity option.